Maya Ubud Resort & Spa in Ubud, Bali. I’ve woken early hoping to check emails only to find my new Mac PowerBook covered in rice and bougainvillea petals. After a momentary gasp the penny drops. The ever-considerate Balinese villa staff placed an offering on the lid imploring the Gods to restore the internet connectivity which was down last night. A warm glow emanates from within me manifesting itself in a wide grin. Sure enough, when I turn the computer on, connection is restored. “Namaste”, I murmur, quickly bowing my head towards the device hoping the staff don’t witness my absurd western worship. The sincere friendly service most visitors receive in Bali is the fundamental reason why many return, including myself and my young family. That and the glorious beach sunsets, sublime taste sensations at cheap warungs (local eateries) and stylish semi-outdoor restaurants, body pampering on tap, plus verdant tropical landscapes. And above all, for the comfortable and sophisticated private villas and world-class resorts. Very few island escapes tick all these boxes and more. Bali is a vibrant sanctuary of Hinduism nestled amongst thousands of Islamic islands making up the Republic of Indonesia. Temples and shrines are scattered throughout the villages and religion permeates every aspect of daily life. You’re guaranteed to encounter ceremonies with locals in traditional dress bearing offerings to the Gods and spirits of the land. Morning beach walks often involve weaving through large groups casting colourful gifts into the ocean. As a sensitive visitor, the rituals and observations affect your consciousness, creating a sense of calm and openness. A humble offering wafts past (to be placed in the shrine) as I relax in my villa pool. The fragrant burning incense stick is comforting. I can’t help but feel that my day ahead has been formally blessed and my wishes just may be granted. Seminyak is the area we like to base ourselves for its cosmopolitan buzz. Fashion boutiques, antique shops and homeware stores line the busy streets, and the golden beaches fringed with palm trees are dotted with luxury beachfront resorts and villas. The area entices surfers and sunset drinkers alike. Jalan Petitenget (in northern Seminyak) is a winding coastal strip that has fast become the island’s new gourmet centre. Scents of fresh ginger, coriander, shrimp paste and tamarind emanate from the humble warungs, and restaurants offering complex flavours from around the globe have foodies flocking in. After a hectic afternoon of shopping in Seminyak, retiring back to the idyllic grounds of a peaceful villa rental in either Kerobokan or the neighbouring Umalas neighbourhood does wonders for frazzled chakras.Both are just a 15-minute drive from Seminyak. Nothing beats entering your villa through giant wooden Javanese gates covered in pungent jasmine into an oasis of happiness: kids splashing in the pool whilst the husband commends the kitchen staff on yet another perfect daiquiri muddled with fresh berries. We sit under the thatched alang-alang lounge pavilion as the tangerine sun slowly disappears behind the property wall lined with flame-red heliconias. The only decisions to be made are, what time should we excuse the Balinese nanny for us to resume parenting duties and Should we bother to shower for dinner? Ubud is the cultural heartland of Bali and urban escapists head there for jungle tranquility. The drive there from Seminyak weaves through hamlets as you ascend into spectacular landscapes of lush forests and sinuous ribbons of rice growing on green terraces that wrap around the hillsides. Despite its commercial efforts, the town centre retains a genuine charm with its wall-to-wall art galleries, cafés and shops selling local crafts and jewellery. Exclusive resort properties are nestled in the folds of the valleys just outside town. Some outdoor enthusiasts use Ubud as a base for mountain-biking, white-water rafting down the Ayung River or trekking up Mount Agung, Bali’s highest volcanic peak. But I’m a fan of luxury lock-down: spending two days absorbing the panoramic views from the edge of an infinity pool that juts out precariously from the hillside. Choosing between an in-house four hands massage or a coconut body scrub becomes the most ‘stressful’ decision for the day. When driving back from the highlands I once asked my driver Wayan why so many scarecrows and flags filled the rice fields. He laughed replying, “Miss D, the flags are not to scare off the birds, they wave to the gods to give us good crop”. At the time I chuckled at the simplicity of their beliefs. Yet with each visit I continue to marvel at the island’s bounty and convince myself that there is a greater force at play. Villa rentals are a cost-effective way of vacationing with family or a group of friends. Most include a private chef and staff, whilst some offer use of a car and driver. Bali Niksoma Beach Resort & Spa: stunning poolside views of Legian Beach. Rooms from AUD$193 (plus taxes). The Royal Beach Seminyak Bali: prime beachfront location and easy access to Seminyak. Rooms from AUD$208 (plus taxes). 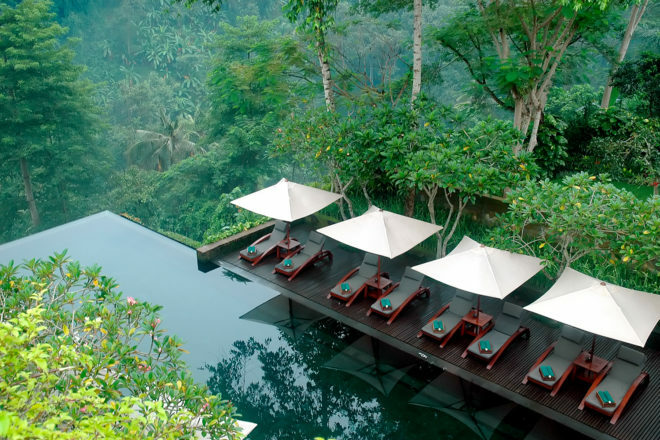 Maya Ubud: set on hillside gardens cascading toward the river with the town centre just a five minute drive away. The Dusun: one to three bedroom thatched-roofed private villas with plunge pools. COMO Shambala Estate, Bali: a deluxe health retreat with villas perched on the mountain. Alila Villas Uluwatu: contemporary villas poised on cliff-tops offering ocean views. Ideal for honeymooners or couples seeking seclusion. One bedroom villas from AUD$660 (plus taxes). Echo Beach: a surfing hot-spot in Canggu. The chilled cliff-top Beach House Restaurant, a Barbados-style café/bar, provides legendary sunset seafood BBQ’s. Nammos Kandara at Karma Kandara Resort: an exclusive getaway in the south, modelled after the private beach resorts of the Greek islands. Desa Seni: a yogini’s tropical nirvana – salute the sun under a shaded pavilion. Jari Menari: a Japanese zen oasis offering body massages with signature long stroke movements. Espace Spa Bali: a tranquil day spa for reflexology, firm massages and deep cleansing facials. Hotel Tugu Spa: a bespoke beachside paradise adorned with antique oriental furnishings. Signature treatments include hot stone massage and mantra chanting massage. Avoid Kuta like the plague (it’s congested with cheap holiday digs, shopping malls and nightclubs). If you’re hunting for affordable trinkets for the kids (imitation sunnies, watches and DVD’s) head to Jalan Padma, Legian. It’s loaded with all-day bars full of bum cracks peeping out of boardies, but better there than Kuta. Dry season is from April to October and that’s an ideal time to travel. Average temperatures, of around 26°C make for a humid stay all year round. • Australians must purchase 30-day travel visas (available on arrival for $23.70 cash). Departure tax is $14.80 per person and paid upon departure. • Expect long immigration queues on arrival (waits sometimes over one hour). • Never drink from a tap. Most hotels/villas provide free bottled water. • The Indonesian Rupiah (IDR) is the official currency. ATM’s are located in all major tourist areas. • It’s insulting to touch an Indonesian on the head. Pass things with your right hand only. • Pack the mosquito repellent, plus a light cardigan for Ubud. • Wine mark-up is steep. Cocktails are cheaper by the glass. • Nannies are a quarter of the price than in Oz (approximately $4 per hour for four hours minimum. bali-nanny.com is an Aussie-run service with Balinese nannies. Waterbom Bali: aquatic playgrounds and water slides set in tropical gardens for all levels of thrill seekers. Rip Curl Surf School: Little Ripper classes for wannabe surfer dudes start at $50 for 75 mins (max three kids per class). Bali Equestrian Centre: offers riding lessons for all ages. A highlight is the coastal sunset beach tour, $67. Elephant Safari Park Lodge: ride and play with Sumatran elephants with the option to stay overnight. Entry and elephant ride $56 for kids. • Taxi from airport to Seminyak: approximately $8. • Three-course meal for one: $15 not including alcohol. • Cocktail at a decent bar: $11. • Driver for full day (10 hours) in an airconditioned four-wheel drive/SUV: approximately $60-80 (including fuel). Café Bali: a colonial-chic boho hub serving cheap, fresh dishes ranging from salad niçoise through to chicken satays. Biku: a comfy antique sanctuary. Swoon over the cake display (decent strong coffee too), or work through the Indo menu. Petitenget: the newest kid on Petitenget’s block evokes the old world charm of an upmarket European seaside bistro with Italian-influenced cuisine. Métis Bali: dine on innovative French cuisine whilst overlooking rice paddies and lotus ponds. Sarong: works with Indian, Balinese, Thai, Sumatran, Vietnamese, and Malaysian flavours to create a distinct modern menu of excellent gourmet street food. The atmosphere is sultry-glam: chandeliers, candles and plush lounges. Warung Ibu Oka: lunchtime crowds gather at this humble eatery across from Ubud’s Royal Palace for its signature dish: babi guling (roast suckling pig served with rice and sayur). Strictly bott’s on mats and no shoes! Jalan Suweta, Ubud. Potato Head Beach Club: a beachfront amphitheatre-with-attitude. DJ’s spin day and night. Simple bar snacks through to French fine dining upstairs. Ku Dé Ta: Indo meets Ibiza at this oceanfront institution. The bronzed and the beautiful lounge here all day, but it sizzles from 5pm when the sun melts into the ocean against a backdrop of cool tunes. Jalan Kayu Aya 9, Seminyak. The Rock Bar: for those who like their drinks on the rocks (literally). Ayana Resort and Spa’s bar comprises a drinking platform poised just metres above the surf. Jalan Karang Mas Sejahtera, Jimbaran.